Rain kept a few hikers away that had planned to meet us, but the fivesome were pleasantly surprised with no rain throughout the hike. We traversed up and down roughly 4.9 miles of trails at Mint Spings Park in Western Albemarle County making a loop on the Fire Trail, Survey Trail, Hollow Trail, Little Yellow Trail, Mountain Orchard Trail, and Lake Trail. Footage was muddy and there were a number of creek crossings after the previous night of intense showers, but we had the trails to ourselves with no other mountain bikers, hikers, or trail runners out early. We enjoyed the solitude! After our two hour walk we enjoyed lunch and chocolate chip cookies under the pavilion by the upper lake. Fishermen were out and trail runners were making their way to the trail head. We acknowledged the nearby memorial remembering the 26 people who died in the charter flight in 1959 crashing into Bucks Elbow Mountain. At this point we all decided a glass of local wine was in order, so we made our way to Stinson Vineyards about 10 minutes away. It was a fun way to play on a gray day in May. It started to rain when we got to the Stinson Winery. How convenient, so we hunkered down in the fermenting room! It was a beautiful sunny spring day as 10 of us starter out on the AT. David Crowe, C J Woodburn, Dan Funkhouser, Dave Abdallah, Jodi Frederiksen, Pete & Bev Fink, Anne Colgate and Jeanne Densmore were led on the hike by Dan Ralston. At the Turk Mountain turnoff Pete, Bev and Dan Funkhouser decided due to time constraints to bypass the side hike to the summit of Turk Mountain and they continued on the rest of the hike logging in a little over 8 miles for the day. The rest or the group went on to the summit for lunch. A perfect valley view was to be had from the summit. We were not very lucky in our quest for the elusive and rare sighting of The Eastern Turkeybeard flower but we did however pass some beautiful spring flowers including the very vibrant Lady Slippers. Starting down Turk Branch Trail the clouds rolled in and the sky opened up with a downpour. Floating through the air was the old axiom “There’s no such thing as bad weather just the wrong gear”. Everyone proved the quote well as we all donned our rain gear and completed the hike in all the colors of the Gore-Tex spectrum. After a couple of fast flowing stream crossings we ended the hike back at Jarman Gap. A wonderful 10.4 mile, 2,900’ hike was to be had by all. On a rainy Saturday morning hike leaders Barbara Martin and Bill Holman were pleased to have a group of 12 come out for our hike from Petite's Gap to the James River on the Appalachian Trail. Bill and Iva Gillet very kindly met hikers at Albemarle High School and Barbara met hikers at Rockfish Gap. Our group included Clai Lange, David Crowe, C J Woodburn, Karen Siegrist, Marian Styles, Dan Funkhouser, Rick Rohrback, Susanna Williams and Brian Muszynski. We arrive at Petite's Gap after a short pit stop in Buena Vista and split into two groups. Barbara led three other hikers on the Appalachian Trail and Bill led the remaining hikers on an alternative lower trail that was the old AT route, Sulphur Ridge Trail. Both groups met later on the AT and compared wildflower notes. The AT group were excited about seeing a clump of rare yellow lady slippers as well as pink lady slippers, trilium and many other wildflowers. The other group saw wild irises as well as many other wild flowers. We all walked to the junction of the Sulphur Springs Trail which Bill's group (Karen, Marian and Rick) followed to Petite's Gap Road and back up to the trail head at Petite's Gap. 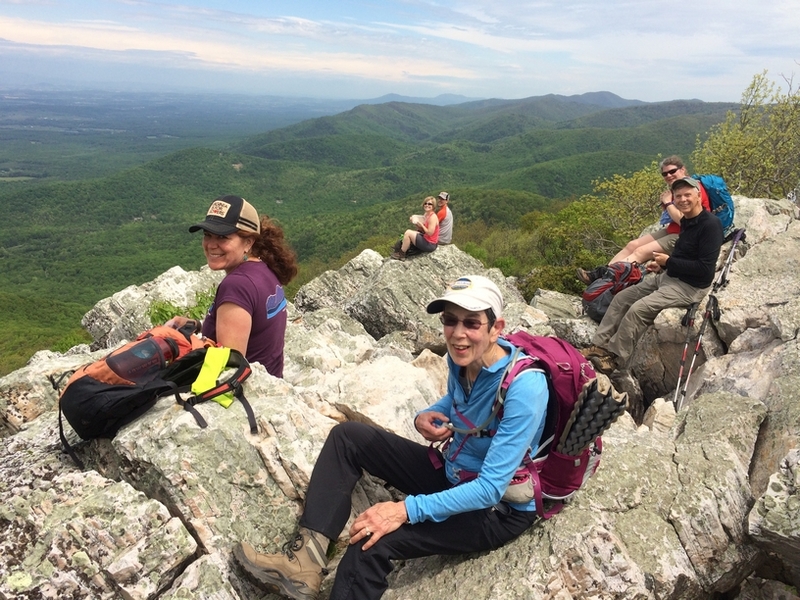 Barbara's group continued north on the AT, stopping for lunch at the Hickory Stand and continuing on over the famous James River Foot Bridge (named after William Foot) to retrieve the two cars that Bill's group had driven back from Petite's Gap. Thanks Bill for doing the shuttle for us! We all met at JJ's Meat Shak in Buena Vista for a hearty dinner and comraderie. Last minute changes of plans led Tony Alimenti and John Shannon to do some maintenance on the Chapter'a section of Appalachian Trail at Rockfish Gap. At our meeting place we met Mark Gatewood, District Manager who was leading a group of people working at Beagle Gap. We used McLeods to remove leaves and loose earth from the drains, and at a number, we widened and lengthened water runoffs to slow erosion. On our way out, we removed some garlic mustard where the trail meets Skyline Drive, after seeing little on the short section we were on. John then continued to McCormick Gap to do some more of the same and found hairy bittercress was the newest unwanted plant to grow there. There were some backpackers who appreciated what we did.